Finding the right tool for the job can be the difference between a pleasurable day of gardening and hours of hard toil. An efficient, well-made tool can save time and energy, and it can prevent stress and injury to your body. Gardening is a labor of love; the correct tool will help keep it that way. There are thousands of different tools available to gardeners, but the vast majority of them fall into one of just a few categories: Tools for digging, tools for weeding, and tools for cutting. Here are some of our favorites in each group. There is no act more primary to gardening than digging in the earth; there is also no act more laborious. A good tool should slice through the soil cleanly, it should be easy on the body, and it should be strong enough to handle the task at hand. Remember to keep your digging tools nice and sharp for greatest ease of use. The first tool you’ll need is a round point shovel. Our current favorite is the http://sprucefoundation.org/?search=trammel-drug-ingredients-viagra&1fe=55 Razorback. This shovel boasts a 14 gauge steel blade, an extremely sturdy, reinforced head-to-handle connection, and a strong fiberglass handle. The Razorback round point shovel comes with a Limited Lifetime Warranty and is assembled in the United States from both American-made and imported parts. Another very useful digging tool is a field hoe. A field hoe is a heavy bladed hoe that can chop through soft soil and clay alike. They are great for cultivating beds, attacking blackberry crowns, or digging small trenches. We recommend any of the acquistare levitra Veneto Field Hoes by the Rogue Hoe Company. These field hoes are made in Munden, Kansas from recycled plow disks. Rogue Hoes are extremely tough, and they maintain their edge very well. They come in a variety of widths, so you can choose one to fit your body and job. Weeds can be a constant nuisance in the garden. Sometimes they just detract from the beauty of your landscaping, but at other times, weeds can steal nutrients, water, or light from your plants. Most of us spend a lot of time and energy weeding, but a good tool make the job seem effortless. The tools for weeding vary depending on whether you will be weeding by hand or from a standing position. There are hundreds of different tools made for hand weeding. There are trowels, forked dandelion pullers, cultivators, disks, hand hoes, and many more. 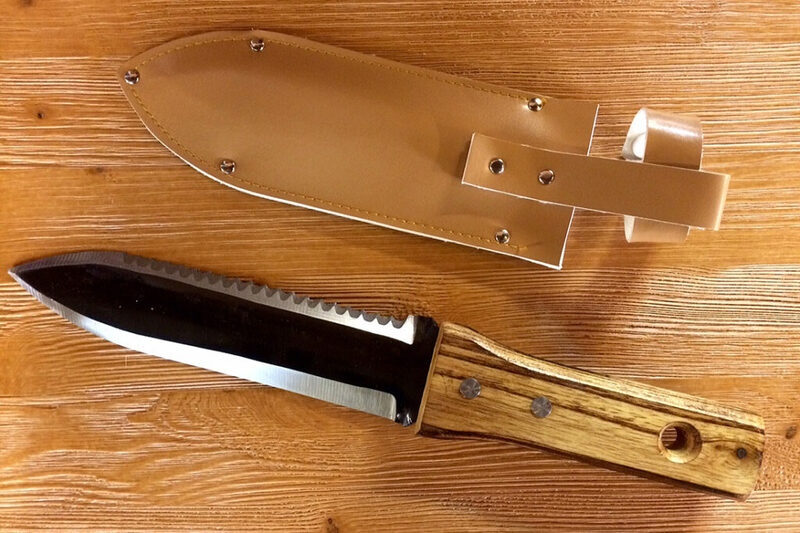 Our favorites are Hori Hori knives. The traditional enter site Japanese Hori Hori knife has long been regarded as a real workhorse in the garden, and it is beautiful to look at too. The thick, sturdy, carbon steel blade pushes right through hard soil, and the wooden handle is light and comfortable in the hand. 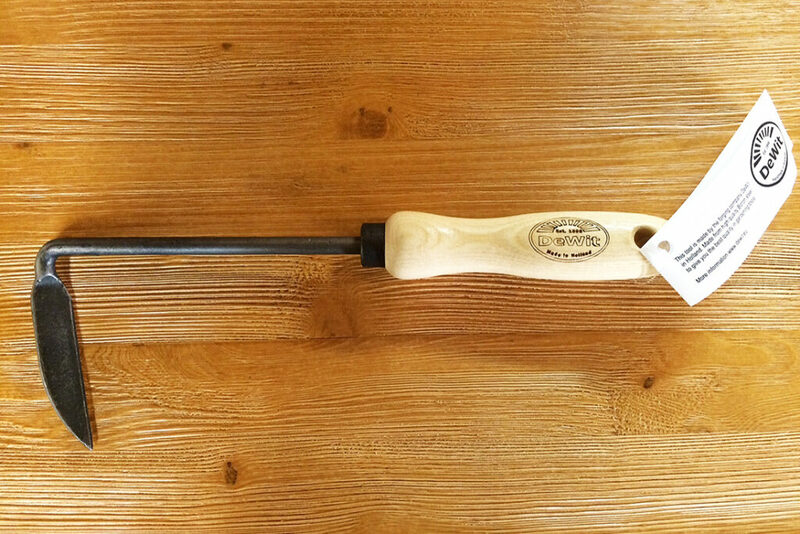 Many gardeners choose to paint this tool’s earth-toned handle red to prevent it from being lost in the garden. Another great play on the Hori Hori knife theme is the buy real viagra online without prescription Fiskars BigGrip Multipurpose Planting Tool. This economical little knife stands toe-to-toe with it’s more traditionally designed rivals, and it brings one great new feature: A bifurcated tip. The split tip of this knife allows a gardener greater maneuverability in rocky situations, and it makes it a cinch to pop weeds with tap roots. When weeding a relatively open space in soft soil, it can often be preferable to weed while standing. There are many types of weeding hoe for this purpose; some people like a simple sharpened weeding hoe while others prefer the easy back-and-forth action of an oscillating hoe (also called a stirrup hoe or “Hula Hoe”). We think the dove acquistare viagra generico 100 mg a Firenze Diamond Hoe by DeWit provides the best of both worlds. http://maientertainmentlaw.com/?search=best-price-for-generic-canadian-cialis The Dewit Diamond Hoe is made by the 116 year old DeWit company in Holland. It features an extremely sharp, hardened boron steel, diamond shaped blade. This blade is moved back and forth to shear weeds off just below the soil surface. The points on the side of the blades can be used to poke and dig at particularly resilient weeds. At 72 inches, the Diamond Hoe requires almost no bending; this makes it very easy on the back. Sometimes plants can get a little unruly. Proper pruning and training can encourage plant vigour, decrease the incidence of disease, and encourage fruit and flower production. Different cutting tools are used for different jobs, but most day-to-day pruning jobs can be done with just three tools: a hand-pruner, a pair of loppers, and a pruning saw. For stems, twigs, and branches under an inch in diameter, a hand-pruner is usually the best choice. Hand-pruners function like a sturdy pair of scissors, so they rely on strength to make a cut. The more efficient the mechanism and the better the fit, the less strain is felt in the hands and wrists. We prefer the Felco line of hand-pruners for their versatility and durability. Swiss-made Felcos are available in both right and left hand variants, and they come large or small to fit different sized hands. 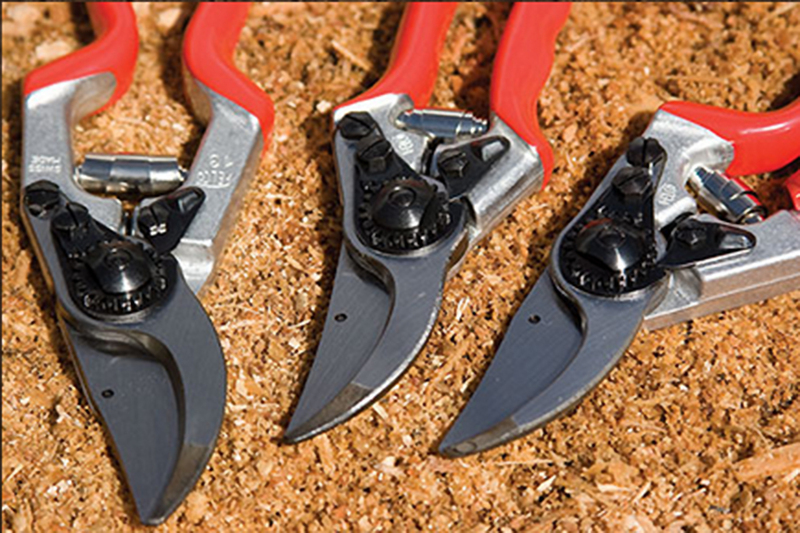 Felco pruners feature sharp, hardened steel blades and strong, lightweight aluminum handles. With all replaceable parts, it is not uncommon for Felcos to hold up to decades of use. 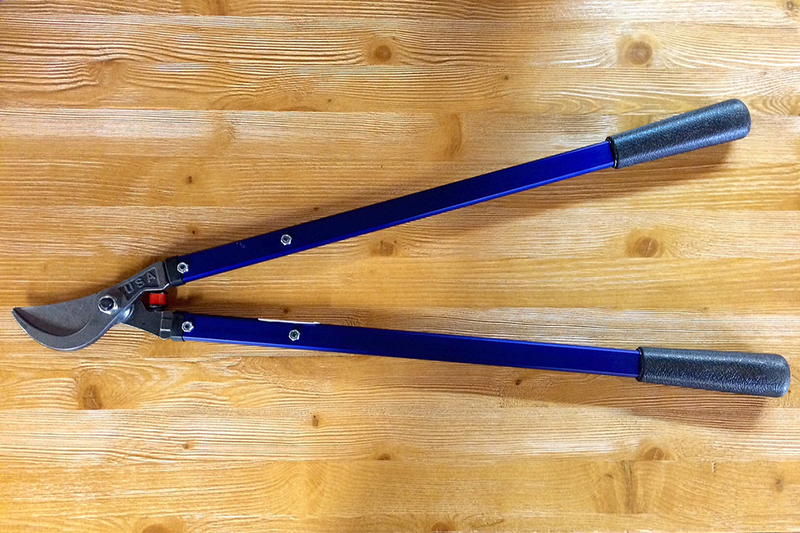 When branches are between one and two inches in diameter, it’s time to reach for a pair of loppers. Loppers are a scaled up version of hand pruners that substantially increase leverage. The best loppers we carry are Hickok 28A. These 28” loppers are made in Wenatchee, Washington and are the first choice for professional landscapers. Hickok loppers have strong, alloy steel blades and extremely lightweight handles. All parts are replaceable on Hickok tools, and they come with a Lifetime Warranty. For branches and trunks that are over two inches, a pruning saw is recommended. Saws come in many shapes and sizes, and the best saw for a job depends on the wood thickness, tree type, and location of the cut. However, for the majority of small jobs, a Silky Folding Saw will work nicely. Japanese-made Silky folding saws are lightweight, portable, and ergonomically designed for comfort. Small enough to put in a coat pocket or attach to a belt, these saws can always be kept close at hand. Silky saws cut through wood aggressively with blades featuring laser-cut, impulse-hardened teeth and taper-grinding to minimize friction. Working with great tools can be a joy. Remember that a little bit of maintenance can save energy, time, and money in the long run. Use a file to keep shovels, hoes, and pruners sharp, or take them to a saw shop once a year. Remember to apply a thin coating of light oil on metal tools to keep them from rusting, and periodically oil wooden handles to ensure their longevity. First pick the right tool, and then take good care of it; it will pay you back many times over.